Volume DeltaPanel is a very powerful indicator that read the supply on Market. 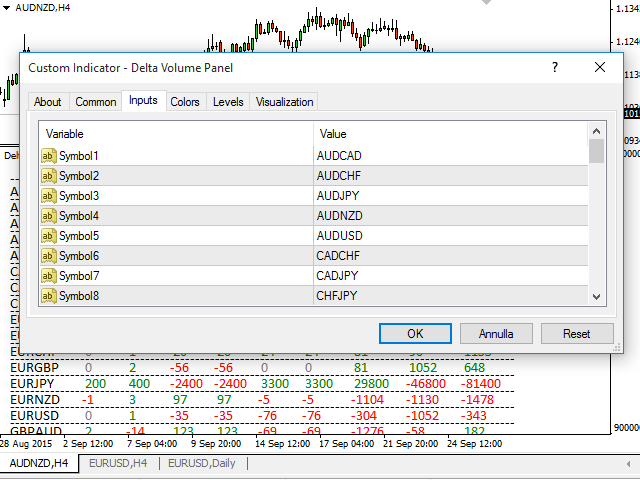 It calculates the Delta from movement of the price and the difference of BUY volumes and SELL volumes. 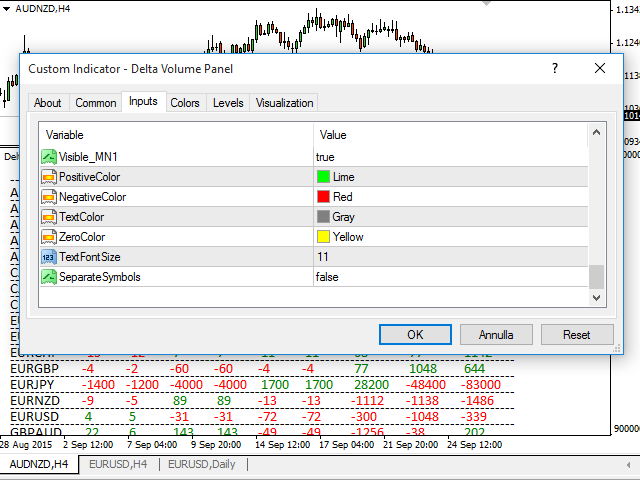 The Volumes are added to price and normalized to symbol points. 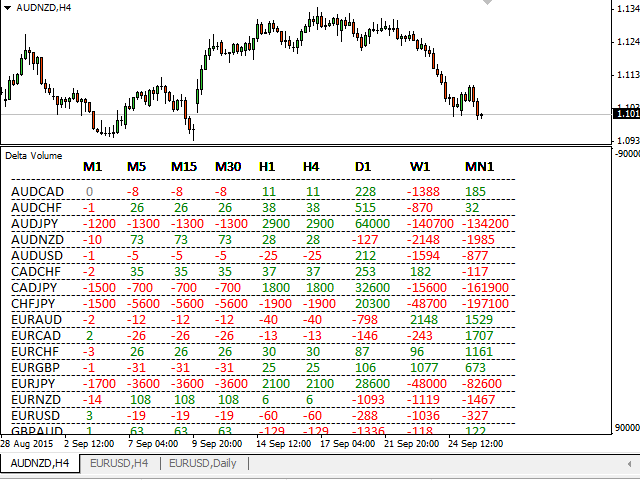 Its special structure allows you to get all Time Frames values available on the platform MT4. Panel can show 28 instruments simultaneously all customizable according to the offer of the Broker. A good observation of this instrument can suggest great entry points and possible reversal. We are confident that this tool will help you to improve your trading timing. This is nice live indicator. But seller has to tell clearly what it does, and what the numbers explain. This indicator show volume of current candle. As I see it, it is not like delta volume on futures. Its a nice indicator but explain clear in a video how it works. This can be misleading. I have pinged in personal message two days back, no response so far. Kindly help in fixing the issue ASAP. Das funktioniert nicht. Der handelt einfach den aktuellen Chart. i just paid for the indicator but i try to have it on my mt4 i just can't get it in there can you help me ? This indicator is simply brilliant! By looking at a single currency across all pairs and all time frames, you can truly get a sense of the direction of a currency pair. Also, there is a hidden bonus in this indicator which even the author doesn't even mention! If your strategy is sensitive to volatility, that is if you need to know if a currency pair is trading frequently or infrequently, the speed at which the numbers change within the indicator will give you a perfect sense of how much volatility is in the market. This is by far my favorite indicator! Excelente indicador para entrar y salir del Mercado. Puede ser mejorado colocando, una columna con la senal en colores incluyendo la hora de la senal. Tambien agregar una alarma con mensaje en la pantalla. You can create a good trading plan from just watching the volume numbers in the panel. I use it to find trend reversal scalp trades. Excellent indicator!!! 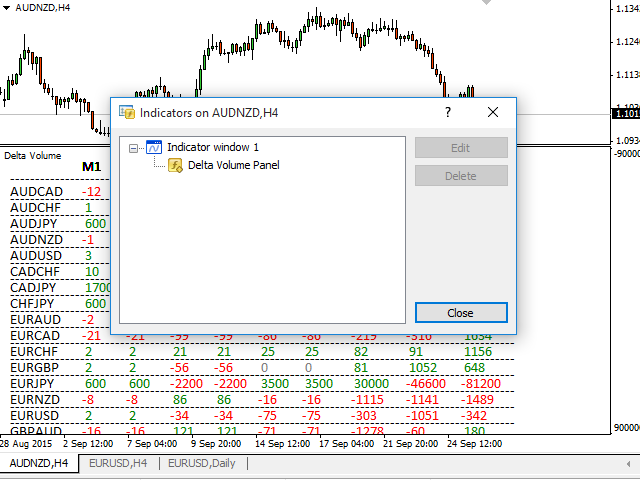 Add feature: click on symbol to open relative chart and color the symbol when all the volume are in agreement. New input: Use_Only_Current_Symbol to show only data relative to current symbol. Correct defect: visualization 0 on JPY symbols.